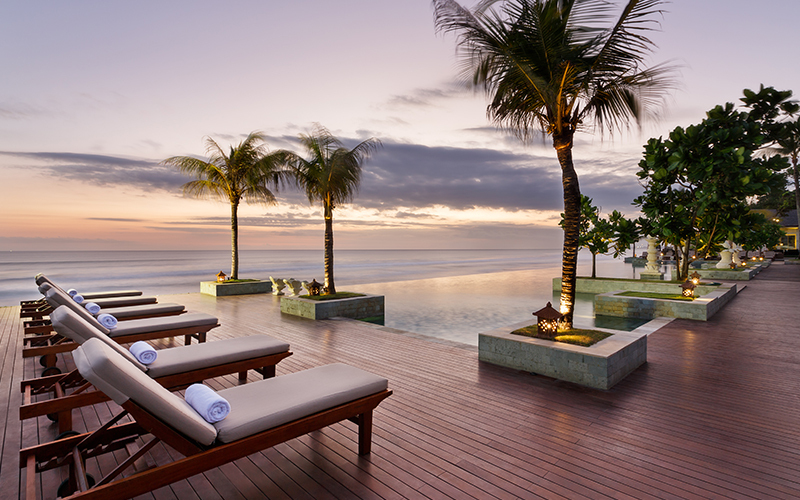 The Seminyak Beach Resort & Spa (theseminyak.com) is a gorgeous beachfront property, ideally located in close proximity to restaurants, bars and shops in Seminyak. 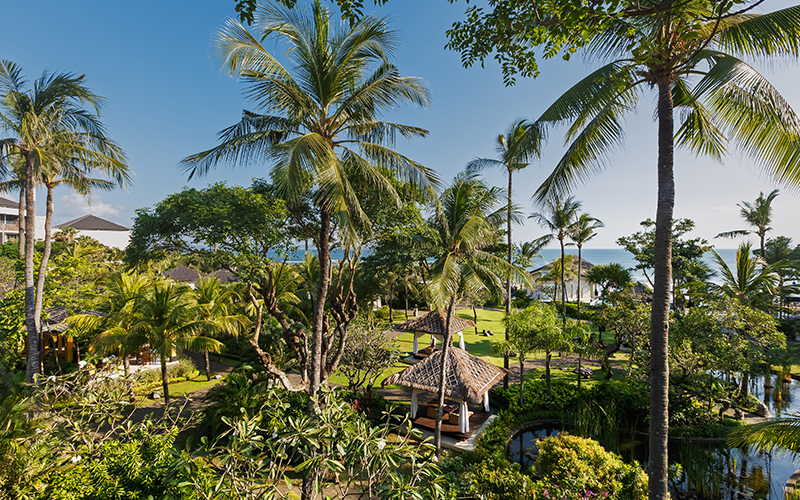 Nestled within lusciously green gardens, The Seminyak is a privately owned, independent property where true Balinese hospitality and personalised experiences are offered. Positioned right on the beachfront, The Seminyak offers the best of both worlds – with the opportunity to relax in peaceful surroundings within the resort and on-site spa, but also to enjoy lively neighbouring beach clubs and restaurants. 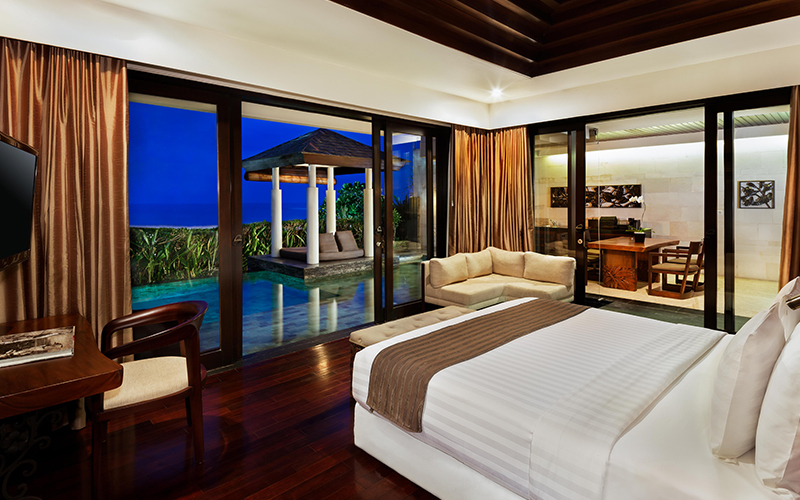 The property offers a range of room categories, including those with garden or ocean views, plus luxurious villas with private pools, which are perfect for couples or families looking for privacy and a more intimate experience. Inside, the resort and rooms are tastefully decorated and draw inspiration from the natural surroundings, with beautiful airy spaces filled with greenery, hand-carved dark wood furnishings and an inviting neutral colour palate. Through the garden to the infinity pool, is the best spot to watch direct views of the sunset over the ocean where sundowners are served – the perfect place to unwind and watch the world go by. On-resort, The Seminyak offers a great range of F&B outlets that serve varied cuisines to cater to all tastes and dietary requirements. Whether you’re looking to celebrate a special occasion over a romantic candlelit dinner on the beach, a traditional Balinese feast, or a fancy fine dining experience, the hotel’s culinary options ensure all guests are happy. Enjoy lazy lunches or a sunset dinner at Sanje Restaurant & Lounge, which serves Mediterranean fare with sweeping views of the Indian Ocean. 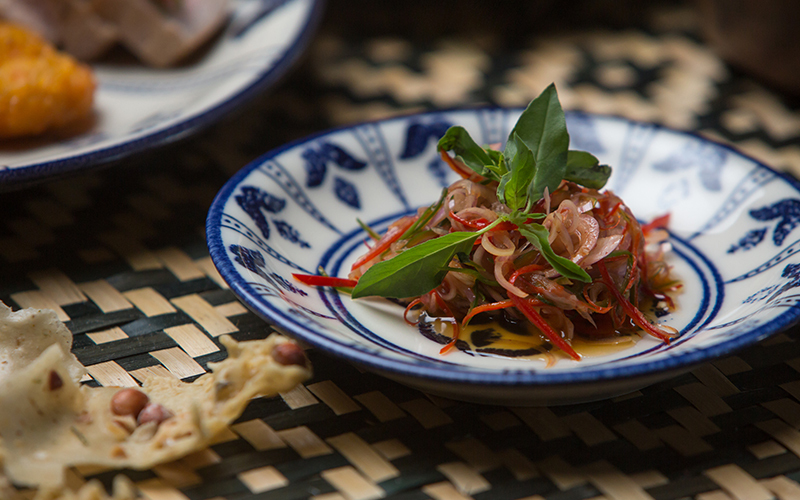 Freshly caught seafood and fish is the star of the show at Sanje, sourced from Bali’s local fisherman. Expect perfectly grilled fish dishes served with zesty salads, Italian pizzas and pastas, grilled meats and poultry, plus a fantastic selection of starters and desserts here. Or for cuisines of the world, head to Santan Restaurant, the resort’s all-day dining outlet for breakfast, lunch, afternoon tea or dinner. Each week, an exceptional Balinese evening with traditional entertainment and authentic Balinese cuisine takes place on the property’s lawn. Set up to resemble a classic market, the buffet features a generous selection of soups, salads, curries, grills, rice dishes and desserts. Bali’s most renowned dishes are made rich by the heavy use of local herbs and spices, making this an evening packed with intense flavours, During dinner, fascinating dances take place – all of which tell a tale, like the ‘charming legong dance’, which is an alluring royal court performance and a delight to watch. For an evening to remember, the private dining options at The Seminyak are well worth trying. Set in beautiful, secluded spaces such as the beachfront pavilion (also available for weddings) or from the comfort of your villa’s terrace, the resort’s team of chefs prepare set menus tailored to a diner’s preference. Options on offer include scallops with olive oil hollandaise and zucchini, beautifully seared veal loin rolled with bacon and topped with shallot confit and thyme jus, or grilled lamb rack with mint sauce and silky potatoes, and more. Klass & Brass is another dining option available on-resort that taps into a 1920’s vibe. It’s a venue where you can dress up and relax to the sounds of live jazz, tasting menus and expertly crafted cocktails. At the Klass & Brass private dining room, a new experience was recently launched for intimate groups looking to enjoy an authentic gastronomic evening. Known as a ‘Rijsttafel’ feast, the exclusive offering allows guests to enjoy homecooked specialties from around the Indonesian archipelago. Each dish features an elaborate blend of fresh ingredients, intricate flavours and aromatic spices accomplished by the culinary team with an extraordinary dedication to preparation and cookery. Only premium local ingredients are utilised, there are no artificial flavourings or additives; sauces are freshly made and spices are ground by hand. 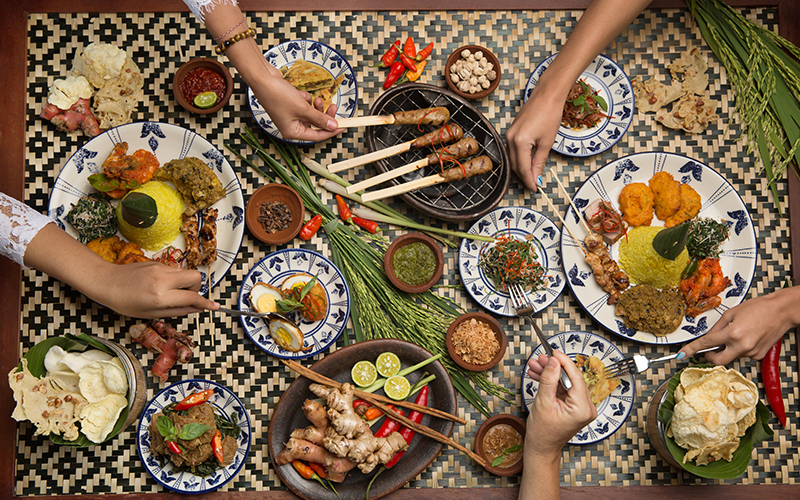 The Seminyak Resort’s Indonesian Rijsttafel celebration presents a generous assortment of 12 different dishes, spread across the table in appreciation of the many different specialties of the far-flung Indonesian islands. Dating back to Indonesia’s Dutch colonial times, the name ‘Rijsttafel’ literally translates to ‘rice table’ in the Dutch language. During their presence in Indonesia, the Dutch introduced the flamboyant rice table meal not only so that they could enjoy a wide array of dishes at a single setting but also to impress visitors with the exotic abundance of their colony. Dishes served during the celebration include fragrant steamed yellow rice or organic red rice accompanied by an assortment of different meat, fish and vegetable dishes presented in small bowls together with the crispy crackers known as ‘Kerupuk’, the pickled vegetables known as ‘acar,’ and a collection of hot fresh chilli and onion sambals and spicy sauces. Dishes include ‘Rendang Sapi’, which is a famous Sumatran delicacy created from succulent chunks of beef stewed in coconut cream and spices. The ‘Ikan Tuna Sambal Matah’ is seared tuna with a sambal of shallots, lemongrass and coconut oil, while ‘Ayam Betutu’ is chicken stuffed and basted with local herbs and spices before being wrapped in banana leaves and cooked in an earth-oven. Another classic is the duck dumplings called Ares Bebek, and the ever-popular ‘Martabak’ – crispy fried pastries filled with chicken, spring onion and Indonesian spices. ‘Sate Lilit’ is a serving of small kebabs of spiced, minced mahi mahi fish with an infusion of lemongrass and Balinese spices. ‘Sambal Udang’ is a spicy red curry with prawns; ‘Perkedel Jagung’ is a sweet-corn fritter; and ‘Urap Pakis’ is a dish of steamed fern leaves with coconut, chilli and lemongrass. The meal is completed with ‘Klepon’ – small rice dumplings, each with a liquid palm sugar centre that explodes in the mouth, accompanied by coconut ice cream. To book this experience, reservations should be made 24-hours in advance and be for a minimum of eight guests. “Our vision is to maintain the heritage of the country’s cultural diversity and we are delighted to be able to converge and offer a truly authentic Indonesian experience to both in-house and outside guests. Our private dining room at Klass & Brass is a wonderful venue for private celebrations, and what better way to celebrate than with a veritable feast of local dishes,” commented the resort’s General Manager, Michael Luible.